Were you aware that black pepper aids with digestion? The black pepper is great at stimulating the taste buds, it helps the pancreas produce digestive enzymes. Your taste buds send signals to your stomach suggesting an increase in the production of hydrochloric acid, the acid which helps your digestive system digest food. Black pepper can also eliminate the formation of intestinal gas and reduce or eliminate stomach aches. Black pepper also smooths the mucus lining of the digestive system. Black pepper among other nutrients has vitamin E, which adds in healing skin that maybe damaged or cut on. Our featured recipe includes pepper. We hope with the fore mentioned health information about black pepper, that you will include it as well as with any recipe you find and prepare here at -Splendid Recipes and More- or any other blog or web-site. 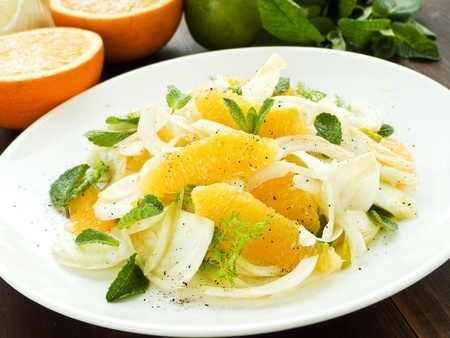 In a large mixing bowl, toss prepared oranges and fennel. Arrange the mixed slices onto a salad platter. Sprinkle with salt and pepper to your taste. Drizzle with olive oil. Sprinkle with the mint. Serve immediately. The olive oil is optional. Also if you desire, you could squeeze lime juice from a fresh lime over the salad. Believe it or not, even though lime juice is acidic, once consumed and digested, it actually balances the pH of the body and reducing the acid through out. If you desire, you can add ½ red onion thinly sliced and 12 imported black or green olives. To add more color to the salad you could use blood-oranges in place of navel. Seasonal Recipe: Two Fennel Recipes! This entry was posted in Soups and Salads and tagged Black pepper, Condiments, digestive system, Drizzle, Fennel, Fennel Salad, Food, Olive oil, Salad, Zest (ingredient). Bookmark the permalink. One of my favorite salads to serve with paella. I haven’t tried it with mint, so I will have to try mint next time. Thanks Jovina. I just learned to like fennel this past year. I have another salad I use it in with watermelon. I also will have to try this Paella recipe you mentioned. Nice… Looks like mint is the trending ingredient this summer…I will try to come up with some deli dish with that just like you. Thumb up!